To Cite: Asghar Ketabchi A. Adolescent extra vaginal testicular torsion Report of two cases, Shiraz E-Med J. 2013 ; 14(3):217-219. Extra vaginal Torsion of the testicles is typically seen in neonates. This condition is extremely rare in adolescents. We report two cases of delayed extra vaginal torsion in two adolescent brothers, without any obvious predispose field as gubernacular or bell clapper abnormalities. Following the diagnosis of acute scrotal condition, surgical ex-ploration was performed. The left testis of both patients were affected and after a tor-sion length ranged from 4 and 5 days, presented with blue color gangrened testis that twitched with vaginal tunica. Left orchidectomy, along with a fixation of right tunica vaginalis to Dartos tunica were carried out in both cases. The incidence of torsion in males younger than 25 years is approximately 1 in 4000.Torsion of the testis, or torsion of the spermatic cord, is a surgical emergency because it causes strangulation of testis blood supply with subsequent organ necrosis and atrophy (1, 2). However an acute scrotal swelling in children indicates torsion of the testis until proven otherwise. The diagnosis of testicular torsion is mainly clinical, In approximately two thirds of patients, history and physical examination are sufficient to make an accurate diagnosis (3-6).Testicular torsion may be divided into two main types, depending on the anatomical details of the axis of torsion (3). Extravaginal torsion (EVT) of the testis is reported to be the predominant mechanism of torsion in the fetus and neonate and this condition is extremely rare in adolescents In this kind of torsion, twist of the spermatic cord is taking place outside the sack of tunica vaginalis in the scrotum and it may be due to lose connection of tunica vaginalis to outer layers. Accordingly, this entity is considered to have a different surgical anatomy, than the intra vaginal torsions that demonstrate as bell clapper deformity or long mesorchium and torsion of the testis occurs with tunica vaginalis (4). A 10-years-old male was referred for left painful swelled testis. The onset of testis pain was about 6 days ago which at start was severe and sudden, no urinary symptoms or urethral discharge or history of trauma at referred time. General examination including right testicle was normal. An urgent doppler ultrasound confirmed dead testis. 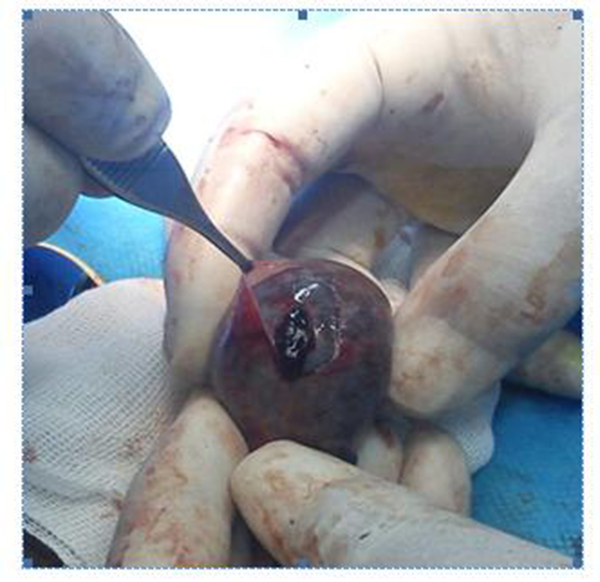 He was booked for a left orchidectomy and right orchidopexy (tunica vaginalis fixed to dartose layer), surgical exploration was confirmed extra vaginal left testicular torsion diagnose, without any obvious testicular anatomic abnormalities (fig. 1). After two years from case one referring, the old brother of case one (a 14 years boy) referred for left swelled testis and history of sudden onset left testis pain about 4 days later, no flow to the testicle with enlargement of the epididymis and spermatic cord, which are avascular at doppler ultrasound examination, finally it diagnosed extra vaginal left testicular torsion and treated as his small brother. Extravaginal torsion occurs more often in neonates and there is not reported such type testis torsion in adolescent or adults, this occurs because the tunica vaginalis is not yet secured to the gubernaculum or outer scrotal layers as defined by Cooper "lack of fixation of tunica vaginalis to the scrotum” (5) and, therefore, the spermatic cord, as well as the tunica vaginalis, undergo torsion as a unit. Extravaginal torsion is not associated with bell clapper deformity or other testis abnormalities. This can occur usually up to months prior to birth and, therefore, is managed differently depending on presentation (7).in review of literatures we did not find any report of extravaginal testicular torsion in adolescent or adults, so we think that, this report could be unique. Although any types of testicular torsion is a rare condition, but it makes no difference whether extravaginal or intravaginal; and both conditions are true emergency and the signs and symptoms as well as the management protocol are the same, that needs early and quick medical attention, and surgical intervention to save testicular tissue.